(Southern Metropolis Daily) Hospitals Bid For Ranking For "Artificially Induced Abortion" On Baidu. By Yan Yan. November 20, 2008. 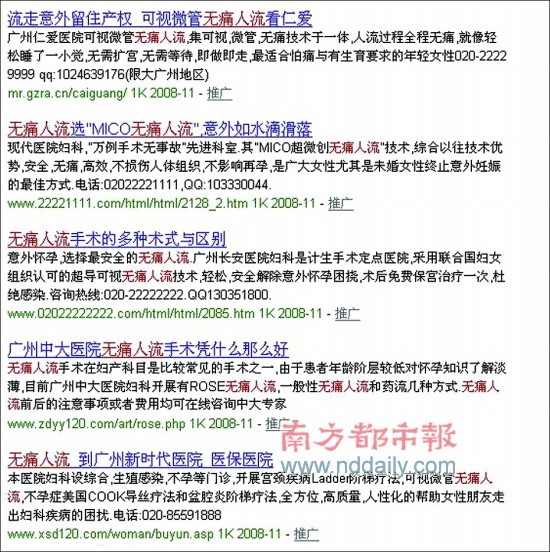 Baidu search results for "artificially induced abortion" on November 19, 2008. On the evening of November 18, our reporter found that when "artificially induced abortion" is entered into Baidu, the results for many private hospitals and clinics came up. The top result was for "Zhongda Hospital". When that page was clicked, the front page of the hospital has a big ad on painless "artificially induced abortion" at what was claimed to be the most authoritative hospital in all of Guangzhou. At the bottom of the page, there were links to "Zhongshan University" and "Zhongshan University Number One Hospital." The website also provided online consultation from doctors. The reporter asked about the the cost of an abortion. The doctor explained the relevant aspects of the procedure and said that the surgery fee was between 380 RMB and 1,680 RMB. The doctor invited the reporter to get examined at the hospital. The reporter asked whether "Zhongda Hospital" was related to Zhongshan University (aka Zhongshan Daxue), the doctor declined to answer and said, "If you want to check the hospital out, you should come down directly." On the next day, the reporter asked the online doctor again about the relationship between Zhongda Hospital and Zhongshan University. This time, the doctor replied: "Our hospital is a medical partner of Zhongshan University Number One Hospital." Yesterday, the reporter went down to Zhongda Hospital with the pretext of getting an abortion. After registering, the reporter was taken to meet a female doctor named Liu. When she learned that the reporter wanted to get an abortion, she took out an examination checklist and told the reporter to pay first. She declined to respond to any questions about the surgical process on the grounds that such advice or examination is not given out for free. When the reporter look hesitant, Doctor Liu told the assistant to take the reporter to pay fees. When the reporter asked about the relationship between Zhongda Hospital and Zhongshan University, Doctor Liu said immediately: "I am just a doctor. I don't know about that." Yesterday afternoon, the reporter spoke to the relevant person in charge at Zhongshan University. He emphasized that Zhongda Hospital is not connected to Zhongshan Univresity whatsoever. "Our university has several dozen directly associated, indirectly associated and teaching hospitals. But Zhongda Hospital is not connected to us in any way." This person also said that "Zhongshan Daxue" is a registered trademark, but the abbreviation "Zhongda" had been registered by someone else. In any case, it is not connected to Zhongshan University. A Guangzhou netizens said that she went through Baidu and found another hospital listed near the top. When she inquired, the quoted fee was several hundred RMB. But once she got there, the hospital laid down a series of medical examinations before the abortion could be effected. You pay 100 plus for the first step. You may not think that 100 RMB is that expensive. But immediately you are hit with a second and different examination. In the end, this netizen would rather lose the several hundred RMB and went to a regular hospital instead. Another netizen was not so lucky. Although the quoted price was 980 RMB, she ended up spending more than 5,000 RMB. (Southern Metropolis Daily) Correcting Only Whatever CCTV Reported On? By Zhang Dongfeng. November 20, 2008. After CCTV's <News 30 Minutes> program exposed the competitive ranking practice, Baidu made a quick response and apologized to netizens. But their corrective actions were limited only to the area of fake medicine. Netizens did not stop with that. Yesterday, netizens offered once again that although Baidu has eliminated competitive ranking on keywords such as "tumors" and "cure for venereal disease," the search on keywords such as "UT," "lottery ticket," "stocks" and so on continue to be dominated by entries that paid their way into the competitive ranking. Many of those are phishing websites that contain malware designed to steal personal information from users. Actually, on the very day that the CCTV program came out, a netizen posted at Baidu's "UT" bar that he had visited a Baidu-promoted website and lost his game currencies. He suggested that Baidu should filter that website out altogether. This netizen named Zhuang from Guiyang city, Guizhou province, told our reporter that he is an avid player of the World of Warcraft game. On that day, he wanted to download Sina.com UT (which is a voice-interaction system frequently used by game players). He entered the keyword" UT" and the top result was a website named "wowdown" that claimed to have the Sina.com UT software. When he went there, his game ID was stolen by a trojan horse malware program. All the game currencies under that ID was transferred as gifts to other players. The reporter noted that as soon as this netizen made the post, other netizens followed with comments. Five out of the first eight comments reported similar experiences. "I used to think that Baidu was reliable and they should be giving the official website for Sina.com UT. But this time, I got tricked by this paid listing." This netizen acknowledged that he had been careless, but he was also strongly dissatisfied with the Baidu practice. "Baidu might have collected several hundred RMB in fees, but how many people has this website hurt? I personally lost 100 RMB in terms of the game currency. Ten people would make 1,000 RMB." On November 18, the reporter made the same keyword search. The top result was this malware site, which was marked as "promoted." When the reporter repeated the same search on November 19, this website was no longer listed by Baidu. "Perhaps the website was shut down, perhaps they used up the budget." The netizen named Zhuang speculated. Such complaints against paid listings occur quite often. The reporter observed that a netizen posted a complaint in May this year titled <Baidu, why are you being an accessory with swindlers?> He claimed: "If you enter 'lottery' into Baidu, the entire first page of results is taken up by websites that Baidu is being paid to promote." He also found that the top-ranked result at the time, National Lottery Net, was a phishing website. This particular post of complaint has been circulated on the Internet for six months already. Yesterday, the reporter searched for "lottery" again and found out that the "National Lottery Net" is not longer the top-ranked entry. In its place was a "lottery number prediction website" by the name of "National Lottery Administration and Distribution Center, the sole designated official website." All the results on the first page were marked as "promotion." These websites even carry similar promotional slogans such as: "Expert prediction skills, fewer numbers, higher chances of winning, small investment for huge profit." They look very tempting. Only when you go to the second page do you find the regular websites such as the sports lottery and so on. One netizen said that if you search for something on Baidu, you might as well as begin immediately with the second page instead of the first. "Stock" is in a similar situation. Yesterday, the reporter entered "stock" in Baidu. The first result is a promoted site by the name of "Shanghai Stock Investment and Development Company." Upon inquiry, the reporter learned that this company that claims to "pick dark horses that will rise sharply for you" and "the sole official website for the Shanghai Stock Exchange" had not been registered with the local Ministry of Industry and Commerce. Interesting, if the search was directly for the name of the company, there are no results on Baidu.